GARDENA — The Gardena Valley Japanese Cultural Institute, 1964 W. 162nd St., Gardena, will be hosting a hoshigaki workshop on Sunday, Nov. 4, from 1:30 to 4:30 p.m. The GVJCI’s previous Day of Persimmons programs were extremely popular, with over 120 people attending each program, and there were many requests to actually learn how to make hoshigaki (dried persimmons), so this year the GVJCI decided to hold a workshop. 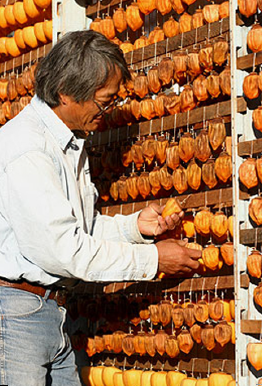 Tosh Kuratomi of Otow Orchards, which specializes in hoshigaki (dried persimmons). • Hachiya persimmons. Other persimmons (like Fuyu) can also be used. Leave the stems intact when picking. There will be Hachiya persimmons available for those who don’t have any; call the office if you need persimmons. • Bucket.GVJCI will have buckets on hand to throw peels away, but participants can bring a bucket. • Apron and/or clothes that participants don’t mind getting dirty.Peeling persimmons will expose the tannins to whatever comes in contact with it and may leave permanent stains. • Plastic bags will be provided, but participants can bring their own storage container to take their persimmon home. The fee is $30 per participant. Sign up on through the GVJCI website, https://www.jci-gardena.org/upcoming-events.html, or call the office (310) 324-6611. Payment guarantees registration. Workshop spots are going fast.